Dubspot contributor and Detroit house guru Mike Huckaby weighs in with some impressions of the new Moog Sub 37 duophonic synthesizer. He comes away impressed to say the least. I have been completely consumed by the arrival of the Moog Sub 37 duophonic synthesizer. It has only been 2 days since I’ve had it, and there is a lot to say about it. At first, and even before it’s arrival, I was thinking, eh, it’s going to be just ok. And if I don’t like it, I can always have it as something to trade and to sell later on. That turned out to be hardly the case. This synth is a keeper, and I have already signed my name on the back of it. So theres no way back. So lets talk about the company first. The folks at Moog are the nicest group of people you could ever meet. They really pack a lot of love into their products. They make you feel like family after the purchase of one of their beautifully crafted instruments. Bob Moog would be very happy with the products they have been releasing after his unfortunate passing. My relationship with Moog started at the beginning of 2012 when i received an email from the company stating that they would like to support my work at Youthville. They donated a limited edition Lil’ Phatty synthesizer to the youth center and they asked me to create presets for their Animoog product during the 2012 Movement Festival in Detroit. (By the way, I rate the Animoog as one of my the top 5 favorite iPhone / iPad apps). The Lil Phatty Synthesizer gave me the first chance to incorporate a piece of hardware into my Youthville workshops, which was really important to show kids the workings of a physical synthesizer. The Sub 37 arrived in the most perfectly packed way it could, with a large sheet of paper explaining most of the functions of the Sub 37 synth, and synthesis terms printed on the inside of the box! I immediately felt the love they pack their products. I took it out of the box and plugged it in right away. 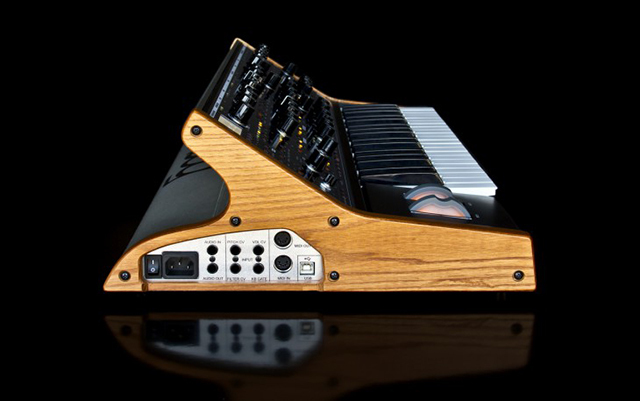 The synth is gorgeous, and is built like a tank. There are high quality components, and a great design found everywhere through out the synth. Moog manufactures most of their parts in their own lab, or in the United States. 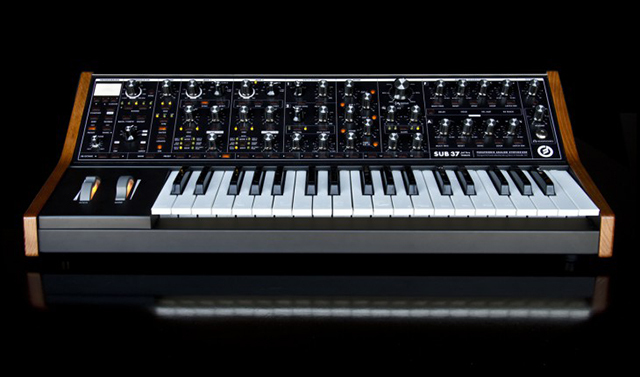 My first impression of the Sub 37: this is the Minimoog for 2014. The Sub 37 offers 16 banks of 16 presets, with the first first 8 or so being factory presets. 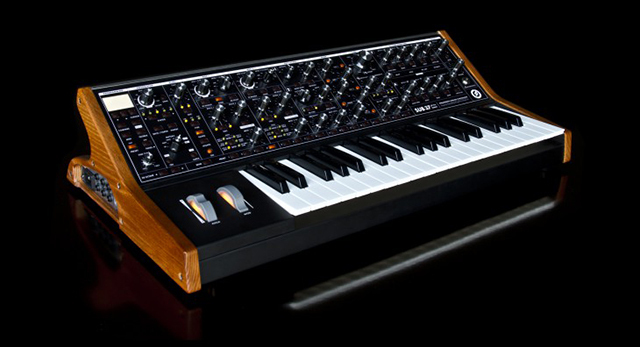 The presets in the Sub 37 are classic examples of a typical Minimoog sound. It’s a great synth for house and techno. I can see broken beat, jazz and rock genres migrating to the Sub 37 as well. It’s really well suited for any style of music. I was also surprised to find that it’s possible to create TB-303 sounding patches with this synth. I will study the presets and then discard most of them to give the synth my own personal signature sound. Generally speaking I am not a fan of monophonic synthesizers.. I favor a polyphonic synths due to the ability to play chords and to create complex sounds. However, as a result of having the Sub 37 synthesizer, my eyes have been opened and now i can see the importance of having a monophonic synthesizer. It gives you the chance to concentrate on building patches around a specific frequency, bass sounds in particular. This is a fantastic monophonic synth that is built by a company with a reputation for high quality products. Its definitely a keeper and has found a nice home in my studio. By the time you have have made 256 of your own presets on the Sub 37 you will have one of the meanest monophonic synths on the market. The sequencer and the duo mode, which allows the user to pitch the each oscillators independently, are the greatest features of this synth. Those are the features where you get the bang for your buck. But I must say that this synth is really packed with tons of nice features, modulation capabilities, and it really has a nice sound. The Sub 37 is all the way around a winner. Good job, Moog! I think most producers looking in the market for a monophonic synth will have to consider it.